This is my favorite coffee cup. It was given to me years ago by a friend I really love. From her I have learned perspective, forgiveness, humor and how to sprinkle glitter on everything. As you can see, the cup has a chip and a crack. And that makes me love it all the more. When I drink from it, it is literally in my face and reminds me that no relationship, or thing, is perfect. We’re all cracked. But we still hold whatever good is inside us. Then I came across this You-Tube video from Chris Staley, Penn State Laureate 2012-13, called Liking Mistakes. 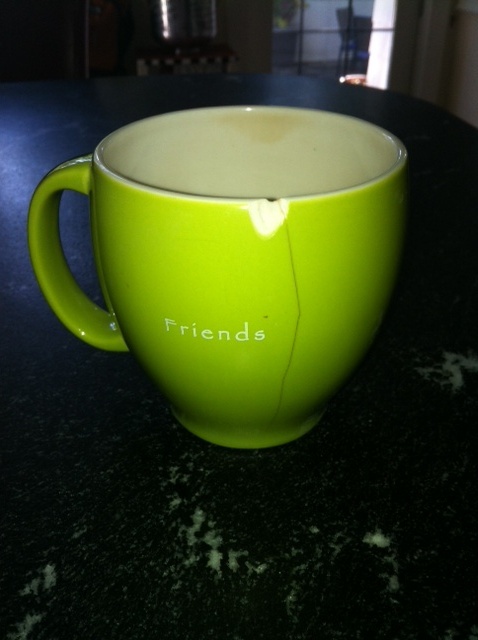 He, too, has a cup that isn’t perfect. The other day, another friend reminded that there is always a back story. Someone acts a certain way and it is easy to jump to judgment. However, you never why they act that way – and where their crack is. How are you MindFULLY cracked Let us know!